Ceramic composition resistors are similar in concept to the familiar carbon composition resistor. Both types comprise a solid body of resistive material, and dissipate energy uniformly throughout the component. This is known as a “bulk” material construction. In film or wirewound types, the resistive material is only a small fraction of the total mass of the component. 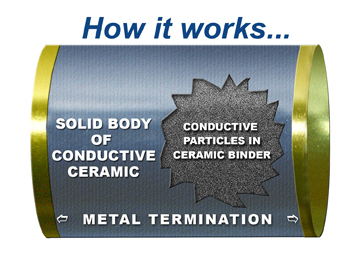 Bulk construction concentrates most of the component mass into the resistive element. Bulk resistors are inherently non-inductive, and offer high energy density. This bestows the capacity for high peak power, and high reliability in pulsed or surge-prone duty. Carbon composition resistors have long been recognized for their advantages in pulsed duty, requiring combinations of high peak power or high voltage with low inductance. This is why “carbon comps” have often been the choice for snubbers and inrush limiting applications. The Ceramic resistor difference is the resistive material, where a high-temperature, electrically conductive ceramic replaces the resin-bonded carbon particles of the earlier type. Since the ceramic dissipates heat more rapidly, higher average power can be tolerated. The high temperature capability of the ceramic allows much more energy density than carbon composition, which means smaller or fewer parts, with resulting better reliability and lowered cost. Ceramic resistor resistors also exhibit better stability under extremes of voltage and temperature. Like other “bulk” resistors, they are non-inductive. This makes them ideal for high frequency applications. The simple construction, consisting mainly of the conductive ceramic material with bonded metal contacts, is highly reliable. Selection of the proper material from among several options allows the properties to be controlled and tailored to the application. A wide variety of geometries are easily produced, meeting requirements from Hundreds of Joules to Mega Joules. This entry was posted in post-format-gallery and tagged Fuse, Fuse, Fuse, Miniature fuses. Bookmark the permalink.